The Ringling Museum of Art asked New College professor Stephen Miles to perform the John Cage Song Books in an exhibition of Joseph Beuys's multiples as part of the museum's education outreach program. Miles, along with Cynthia Heininger, R. L. Silver, and New College students D. Ross and Angus Jameson, and assisted by four student technicians (Erin Hannon, Chris Mitchell, Jason Rosenberg, and Eddie Vasquez), performed the many songs throughout the exhibition space. All performers were stopwatches, and their movements were choreographed to last exactly one hour, as each took his or her own path. Audience members were free to choose their own experiences, whether they stayed in one place, followed a particular performer, travelled to where sights or sounds intrigued them, got caught up looking a the artworks, or simply wandered. Most did all of the above at one time or another. At the end, with all performers and technicians lined up in the center of the space, as the stopwatches were clicked off there was a beat of silence—then a rush of applause from the astonished audience, who had never experienced anything like this before. This performance and its reception were the genesis of New Music New College. The following year the Ringling Museum asked again for a performance to take place in one of their galleries—this time, in Blurring the Boundaries, a collection of installation art. Professor Stephen Miles, along with R. L. Silver and new College students Marylee Bussard, Shannon Dunn, Allison Fremont, Monique LaCour, Chris Mitchell, Matthew Moore, Jason Rosenberg, Erin Slemmens, and Isabel Thompson presented five of Pauline Oliveros's Sonic Meditations. Again there was no fixed "audience" space, but this time instead of wandering the audience remained in place, dispersed throughout part of the exhibition space, for the first two pieces. After demonstrating Meditation XV ("Zina's Circle"), in which a circle of performers holding hands "pass" a pulse of sound around the circle, everyone was invited to join the Meditation, and a much larger circle snaked around the entire space. So in this way the physical space and the social space combined as scores of people created one music-making organism. The final two Meditations were performed in a room specially constructed for artist James Turrell's Stuck Red, Stuck Blue, wherein the only illumination was from two rectangles of these colors mysteriously emanating from one wall. Immediately the quiet of the physical space pervaded the mood of the audience, who were once again invited to join in the final Meditation, a piece concerned with focussing on one's breath. Encouraged by the responses of the two previous concerts, Professor Miles, assisted by R. L. Silver, presented a concert at the Mildred Sainer Pavilion on the New College campus. This marked the first time they used the title New Music New College. Called "Speech Acts," the concert consisted of pieces that explored when speech became music and vice versa. The same program was presented again one week later. The concert opened with New College student Jason Carl Rosenberg's Carnival performed by Cynthia Heininger, student Kartina Amin, Miles, and Silver. Carnival uses text and gesture controlled by a changing and complex rhythmic structure (a technique known as metric modulation) to evoke the joy, noise, and chaos of a fair. The next piece was by Amin and performed by student dancers and reciters: Wanting . . . a History of the Art. Heininger then performed Luciano Berio's Sequenza III, a tour de force for solo vocalist. Silver contributed Time, spoken in varying rhythms by him, Heininger, and Miles to the pulse of a ticking clock. Miles followed with a solo piece he composed, LTG, for Lips, Tongue, and Glottis. The work begins with sounds make only using the lips (with percussion provided by hands and feet), then progresses as the tongue and eventually the glottis are used. At the center of the piece the mouth is used only to filter pitches being produced by the throat; then the piece reverses itself, until only the lips once again produce sound. 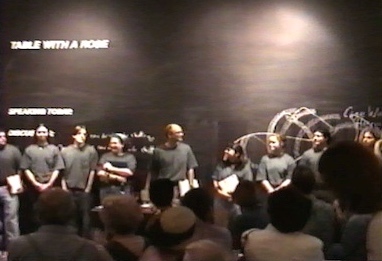 After a second piece by Amin using electronics and speech, Silver finished the fist half of the program by performing Roger Marsh's theatrical work Dum, where texts from Emerson, Donne, Dante, and others are fragmented and rearranged as the performer punctuates the piece using a tam tam, a hammer, and scrap metal thrown into a bucket. The entire second half of the concert was Kenneth Gaburo's Lingua II: Maledetto for seven speakers (Miles, Silver, Amin, Rosenberg, and New College students Lisa Pokorski, Steven Jones, and Nadia Stegman). Ostensibly a treatise on the screw—in all senses of the word—it becomes a dense counterpoint, with tempi denoted in words-per-minute. There was no performance in calendar year 2001, but starting late in the year Miles, Silver, Gail Kennedy Broxon, Paul Lewis, and New College students Maya Lily and Kartina Amin began working on the extended vocal technique called reinforced vocal harmonics, or throat-singing, that is central to performing Stimmung by Karlheinz Stockhausen. By careful shaping of the mouth a singer can emphasize a single harmonic (a pitch that is an arithmetic multiple of the frequency of the note being sung, and is actually contained within the timbre of that note). As any note contains many harmonics, a singer can produce melodies without changing the root note. In Stimmung, which NMNC performed three times in April of 2002, each singer has only three to six root notes to sing over the entire hour or so the piece takes, but produces many upper pitches that comprise extensive melodies. The work involves texts—including poetry, names of gods of various cultures, and days of the week—that become incorporated into the singing.